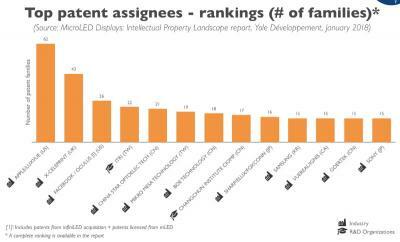 As of December 2017, Apple appears to have the most complete IP portfolio, covering almost all key technology nodes. Other companies like Sony, with a smaller portfolio but which had a head start, might own more fundamental design patents with strong blocking power. Yole estimates the multitude of players in this industry with patents across many technology areas will lead to complex licensing and legal battles once Micro-LED displays enter volume production and enter the market. Looking to the future, Yole believes that initial success in smartwatches could accelerate technology and supply chain maturation, making microLED competitive against OLED in high end TVs, tablets and laptops. In Yole’s most optimistic scenario, the market for microLED displays could reach up to 330 million units by 2025.